I did my first walk yesterday morning, with my wife and a friend from church. This was round the Meridian South estate, a recent development on the site of the former Hither Green Hospital. It was a quiet and still morning although there were a few people up and about; I was surprised by how many stopped to chat. We walked from the clock tower out onto Woodlands Street then back into the estate via Hospital Way, passing the clock tower again before coming out on Stainton Road. In the next few days I hope to figure out how to include a route map from Google. 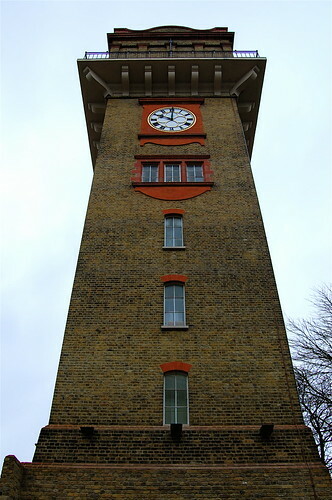 For today, though, I just wanted to report that the walk was done and, as you can see from the shot of the clock tower above, that I turned up (just) on time. Click on the image to see the other pictures I took. Wulf - nice photos as usual. I hope to make the next walk. 10am on New Years Day was a bit early for me! I have never been up close to the tower ...but i am glad the developers included it in their plans.